I notice that Imogen Heap is continuing with the free streaming of her album Ellipse . And no doubt significantly because of the free streaming, Ellipse is charting at #5 on Billboard. It is a glorious album, though I think we can pretty definitely count the free streaming of the album on the web as a very effective strategy. Perhaps it will become commonplace to stream music for free in order to maximize sales. I’d be keen to know the proportion of sales of this album and the songs on it online versus through CD. It would almost be surprising if she sold much in CDs at all, because her presence is so online.. I notice Imogen on Twitter now has over a million followers. ABC Radio National Future Tense this morning featured a discussion on the future of influence (click here for the podcast of both the radio program, and the unabridged discussion between Duncan Riley and myself). It kicks off with a quote from Chris Saad saying that influence and reputation are the currencies of the day, even more than attention. When asked why we rebadged Future of Media Summit as Future of Influence Summit this year, I explained why “influence is the future of media”, and the five key trends in how influence is transforming society. Duncan pointed to how the rise of Internet and social media means that influence can now be global. He also raised the issue of trust agents, and what it takes to be trusted as a publisher. We have more choice in what we look for, and so we need markers of credibility. On the topic of business models for influence, I talked about two key ideas. The first is whether and how individuals can profit from their influence, and how that will develop. The second is the emergence of influence as a currency, and the companies that profiting from making influence explicit for companies. Listen to the long version of the interview for more details. I just got off an interview on the future of influence on 2SM radio which lasted almost 15 minutes – close to a record for my interviews on live AM radio, which tends to do 3-5 minute segments. The talk show host was clearly fascinated by the issues of how influence is shifting away from people like him, and towards the unwashed masses. It used to be that people were influential by virtue of their position, such as CEO, journalist, or politician. In a world of blogging, Twitter, and social media anyone can become highly influential, shaping how we think, behave, and spend. Companies can ignore no-one. As many more become heard, a truer democracy will emerge. “Computer games don’t affect kids; I mean, if Pac-Man affected us as kids, we’d all be running around in darkened rooms, munching magic pills and listening to repetitive electronic music”. 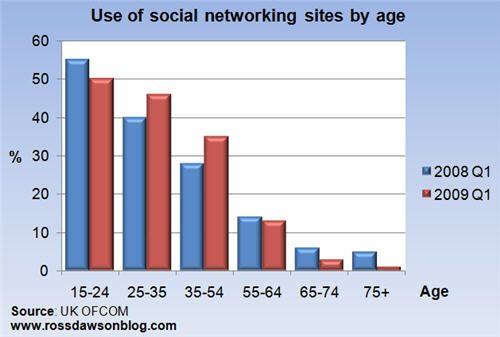 Adults take over social networking, children bail out? UK telecom regulator Ofcom has released a major study on use of telecommunications in the UK, out of which some interesting statistics on use of social networking have come. Part of it is definitional – what constitutes a social network? When young people use the Internet, they are primarily using it to connect with their peers. Whether that is on Facebook, through content sharing, or on music sites, they are effectively social networking. The significant drops in use of social networks by the 65+ year olds makes me question the survey methodology – I find it hard to believe that 80% of the over 75 year olds who were using social networks a year ago have dropped out with none taking their place. Here is the data as a spreadsheet, kindly provided by The Guardian’s Datablog. https://rossdawson.com/wp-content/uploads/2016/07/rdawson_1500x500_rgb-300x100.png 0 0 Ross Dawson https://rossdawson.com/wp-content/uploads/2016/07/rdawson_1500x500_rgb-300x100.png Ross Dawson2009-08-06 14:24:052009-08-06 14:24:05Adults take over social networking, children bail out? As always, a strong disclaimer comes with any generic set of scenarios like these – scenarios really must be created by the users themselves for specific decisions and in context (for the full disclaimer as well as a brief background on using scenarios in the strategy process see my scenarios for the future of financial services). When we think about the future, there are some things we can predict better than others. One of the things we have the best idea of is demographics and age distributions. There remain uncertainties such as improvements in health care and gerontology, the rise of unforeseen diseases and pandemics, and devastating war, but by and large we can be fairly confident of our demographic forecasts. In recent keynotes I’ve done on technology in aged care and the future of the global health economy I examined the implications of future demographic profiles. The forecast profiles for 2050 for some of the world’s largest economies are shown below. Source for all of the profiles is NationMaster, an excellent repository of country information. Of all of these countries, USA is the country which will have the least imbalance to the elderly, accompanied by a dramatic shift in ethnicity of the young. One of the many implications of these age profiles is the inevitability of gerontocracy – rule by the elderly. Given the age profiles below, it is starkly clear what segment of the population any warm-blooded vote-seeking politician will seek to woo. In other words, given a democratic future, we can expect government policies to be unmitigatedly pro-aged, with barely a look in for the young. Fortunately I’ll be old by then. Tomorrow morning I am doing the second day opening keynote at ITAC09 – Information Technology in Aged Care conference. Here is my presentation – as always these are intended to accompany my speech, not as stand-alone slides.